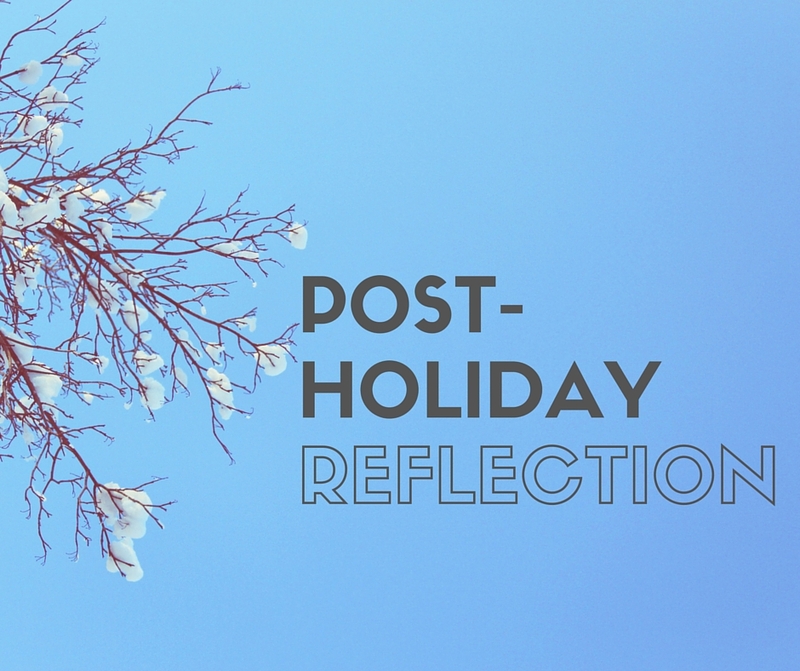 With the New Year on the horizon, and Christmas already in the rear-view mirror, I thought that today was the perfect day to reflect on the holiday season: what happened, what I loved, what I would like to change moving forward. This is especially fitting since outside the window lies a snowy and white landscape, and curling up in the TreeHouse with a hot cup of tea and my laptop is all I want to do. As I think about the difference between life this Christmas and that which it was last year, I can’t help but beam with joy and thankfulness. Back then, I felt stuck. I felt unhappy, unsuccessfully, uninspired, and began to struggle with anxiety. And here I am, just 12 months later: I have a beautiful home, a wonderful husband-to-be, two great jobs were I work with the most incredible people. I am so proud. I am so blessed. This year, Sean and I got to start working through how we envision the perfect Christmas, and how to begin incorporating that with each of our families’ traditions. 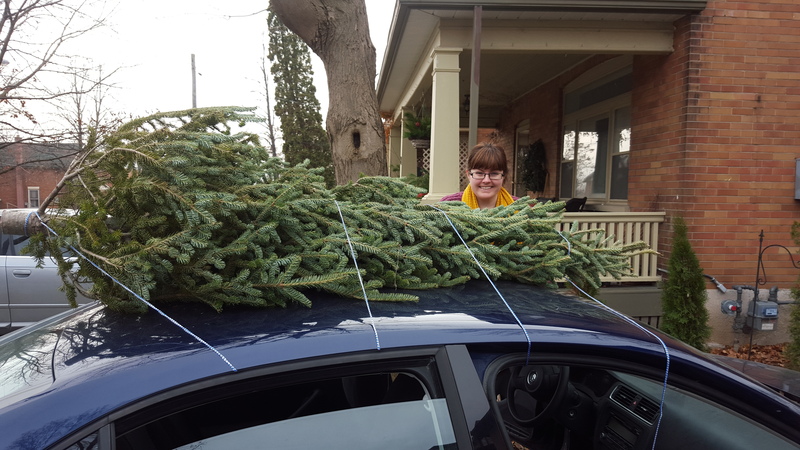 Instead of chopping down our own Christmas tree like we had initially planned, we picked up a beautiful pre-cut one. It was perfect – skinny, tall, sturdy, not smelly, and long-lasting! We even sawed a thin piece off the bottom to make a cute little Christmas ornament as a keepsake (and to keep our tree greener for longer). We had Christmas dinner with my family on Christmas Eve, and stopped by the Quinlan’s to pick up home-made cinnamon buns to start our morning off on Christmas Day. When we got home, we shared with each other a Christmas Eve gift – DVDs and new pyjamas. On Christmas Day, I was up early to get the cinnamon buns into the oven and the coffee on. Not long after, Sean was up and it was present time! My favourite part of the morning was seeing Sean open the turntable that I got him – he was so excited! I’m going to have to work on the Christmas Breakfast portion of the festivities for next year. 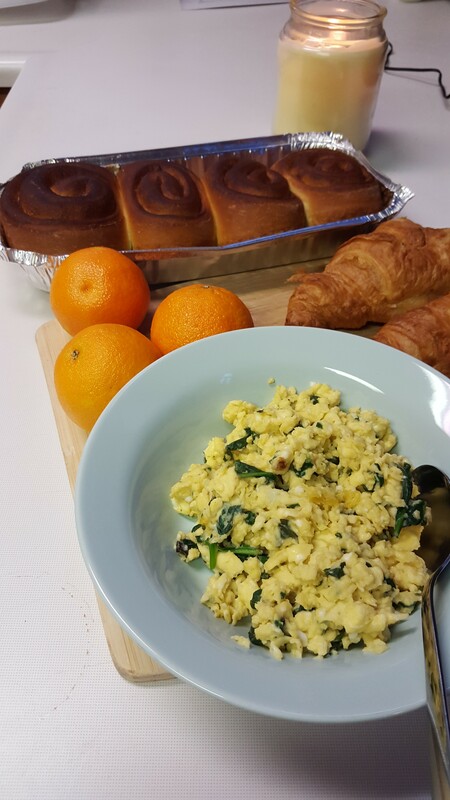 The scrambled eggs were wonderful, as always, but I learned to only buy Primal Cuts bacon from now on (my Shopsy’s bacon that I got on sale was at least 80% fat, wouldn’t come off in strips, and ended up being thrown out). The rest of the morning to late-afternoon consisted of present-opening with Sean’s family and visiting (errrr – napping) with my family before dinner back at the Quinlan’s. Most of the gang was there, so it is quite the difference between my family’s four person Christmas dinner and his 25+ person dinner. We all received some exciting news; there will be yet another wedding in the coming year (we’re up to 3 in the family!). 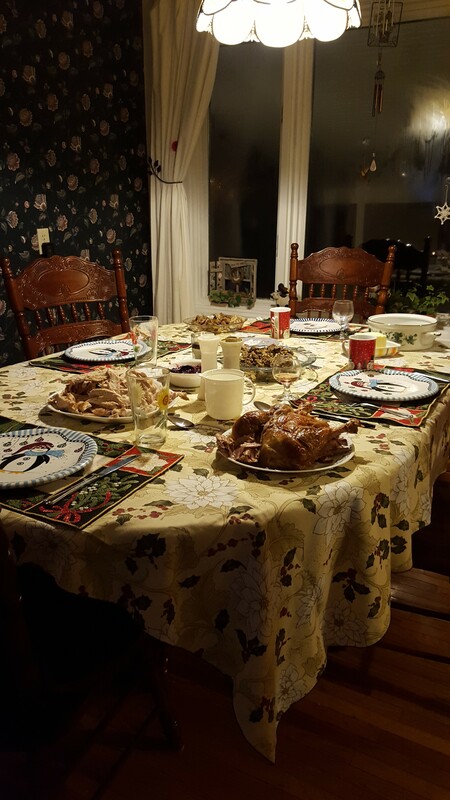 I had to duck out of Christmas dinner a little early because I was on the 8pm – 2am shift at The Warming Room. To be a part of something so much bigger than you are is so humbling, and I wouldn’t have wanted to spend my Christmas night any other way. The kitchen table set for Christmas with festive table coverings and Christmas crackers, and all were welcomed to sit around the table to enjoy the Christmas meal together. As heartbreaking as the circumstances are, it was a heartwarming sight to see. The Christmas dinners wrapped up on Sunday night where we went out to the Barry Farm for the annual Deep-Friend Christmas. Think of the copious amount of food that is typically offered at a holiday feast, and substitute it with the same amount of food, all deep-fried. We’re talking mozzasticks, cheese balls, chicken balls, french fries, sweet potato fries, pickles, mushrooms, wings, corn fritter – on my! It is such a fun way to end off the season, and a good way to inspire healthy eating going into the New Year! I am so thankful for all the love, great memories, and fond traditions at Christmas time and throughout the year. There is one tradition that I am hoping to slowly chip away at: Christmas presents. Despite how exciting it is to receive lots of gifts to unwrap, I would love for the focus to move away from the presents, and instead put the emphasis on our families – sharing great food, laughter, and time with each other. A Little Life Box from my friend Catherine – it’s packed with so many great things: healthy treats, tea, vitamins, remedies, creams and more! 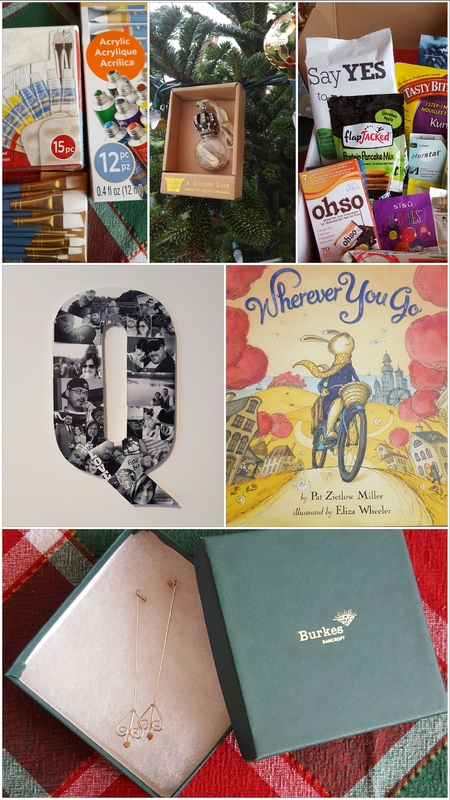 “Q” – Jenn, made this for us and it is so beautiful. We have it hanging in our bedroom and brought it with us to show off on Christmas Day! “Wherever you Go” is the most adorable children’s book I’ve read in a long time, and Sean picked me up a copy! Make sure to buy this for all the little ones you know. Drop earrings from Burkes Jewellers – not only do I love them because they’re gorgeous, and because my parents got them for me, but because they’ll always remind me of my home-away-from-home in Bancroft. There is still a lot of celebrating to do. New Years in only days away, and my Birthday is less than a week after that. Each celebration just gives me another opportunity to look at my blessed life and be thankful for all that I have. What do you think of the Consumer Christmas? Do you have any family traditions that you love? Any that’d you’d love to lose? Sending you warm holiday wishes on this chilly, icy, Canadian-winter day!